After emerging with the $100,000 Grand Prize at the 2017 M-Prize Competition, the largest prize for chamber music in the world, Russian Renaissance has firmly established itself as one of the most electrifying and exhilarating ensembles of today. Through stunning performances of everything from tango and folk to Classical and jazz, Russian Renaissance is redefining the possibilities of their traditional Russian folk instruments (balalaika, domra/domra alto, button accordion, and balalaika contrabasso) and capturing the attention of audiences worldwide. What makes Russian Renaissance truly special is their ability to both dazzle with breathtaking style and touch the hearts of listeners of all ages and backgrounds. 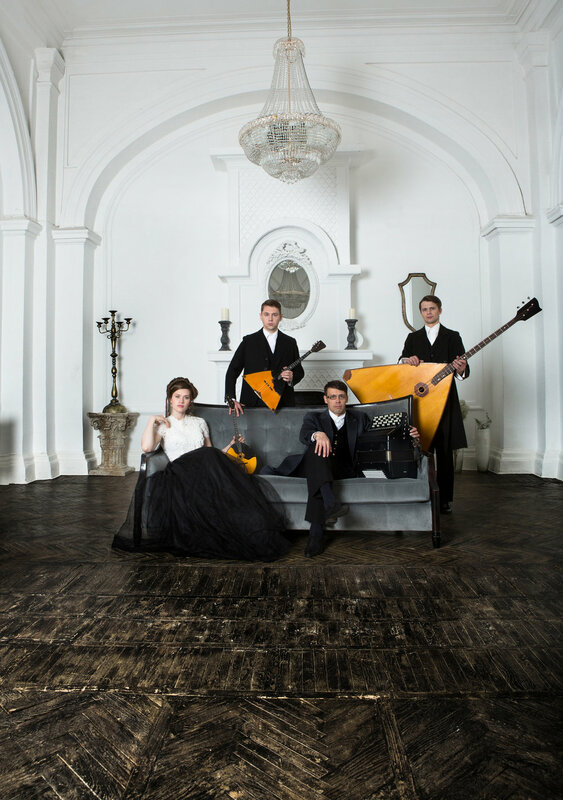 In addition to their success at the M-Prize Competition, Russian Renaissance has also received a Gold Medal for Chamber Music at the 1st Vienna International Music Competition (2019), 1st prize at the 69th Coupe Mondiale in Russia (2016), and was named Musical America’s New Artist of the Month (March 2018). Recent and upcoming performance highlights include Russian Renaissance’s widely acclaimed debut at UMS (described by one critic as “one of the finest displays of musicianship in the world”), their highly anticipated debuts on Lincoln Center’s Great Performers Series and Kennedy Center’s Fortas Chamber Music Series, and appearances at Saratoga Performing Arts Center, Wheaton College, Da Camera of Houston, Hope College, Festival Napa Valley, Peoples’ Symphony Concerts, The Berman, Midland Center for the Arts, Musical Bridges Around the World, and National Sawdust, among other leading venues in North America. International appearances include concerts at Izumi Hall (Osaka), Tchaikovsky Concert Hall, YOTASPACE Concert Hall, The Youth Theater (Rostov-on-Don), and Theater of Uzice (Serbia), in addition to extensive tours throughout Europe and Asia. We greatly appreciate your financial support for future projects and tours. Please follow the link below if you are interested in making a donation. Thank you!